This week, William Henry continues his stunning conversation with Edmund Marriage, touching on such matters as what, exactly was being done to human beings prior to the great catastrophe that enveloped our planet around 9,000 BC. This enormously learned man literally shines a clear light into what has heretofore been a lost past. How did the shining ones appear? Why were they given that name, and what does that mean to us now? PLUS, Edmund Marriage has taken on the project of publishing his and William's�and our�great friend Laurence Gardner's phenomenal book, "The Origin of God." Edmund Marriage has brought Christian O'Brien's classic, "The Shining Ones", back into print and in this interview with William Henry he discusses who they are and what they mean to us in our age. Edmund is the Principal of the Patrick Foundation. His Golden Age Project, inspired by the work of Christian and Barbara Joy O'Brien promotes the recovery of past knowledge in order to resolve many of today's problems. Christian O'Brien devoted his retirement to researching the many enigmas of prehistory, surveying and he went on to discover from Early Sumerian and other ancient texts that the founders of agriculture and civilisation in the Near East c. 9,500 BC was a group known as the Annanage or Annunaki. In this program we talk about the work of Christian O'Brien and parts of his book "The Shining Ones", now back in print and made available by Edmund Marriage from the Golden Age Project. Edmund is the Principal of the Patrick Foundation, an Independent Researcher with a background in Business and Land Management. His Golden Age Project inspired by the work of Christian O'Brien and Barbara Joy O'Brien promotes the recovery of past knowledge in order to resolve many of today's problems. Christian O'Brien devoted his retirement to researching the many enigmas of prehistory, surveying and he went on to discover from Early Sumerian and other ancient texts that the founders of agriculture and civilisation in the Near East c. 9,500 BC was a group known as the Annanage or Annunaki. In the first hour of this program, we begin by talking about the recent passing of researchers Zecharia Sitchin and Laurence Gardner, who also was deepley involved in researching the possibility that these ancient gods were behind agriculture and civilisation. Topics Discussed: Zaharia Sitchin, Kharsag, L.A. Waddell, 3370 B.C., Laurence Gardner, Genetic Engineering, Charles Hapgood, "Maps of the Ancient Sea Kings", Osiris, botanists, genetic engineering, agriculture, collapse of civilization, culture bearers, Gnosticism. Lecturer and Alternative Researcher Edmund Marriage joins us to discuss the Annunagi, Garden of Eden, Kharsag, Stars and Stones forum, Global Warming, the influence of the Sun and much more. 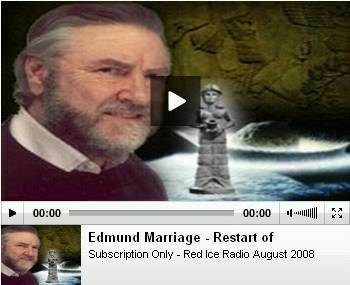 We begin to talk about Global Cooling and Global Warming with Edmund Marriage in our members section. We also discuss Peter Cedrowan Taylor, Episodic Cataclysm, the Sun and Cloud formation, CO2, Ice Age, G�bleki Tepe as a place of refuge from comet debris. We end the program to talk about Neuro-Therapy and electricity to help people with addiction problems and much more. Topics Discussed: Advanced Civilization, Cro-Magnon, Temple, Workshop & Worship, The Aryan's, The Indo-Europeans, Snake Cult's in the Ancient World, Message of the Gods, A Remnant of a Previous Civilisation, Genetic Engineering, Tiamat, Purpose of the Pyramids, Ninkharsag, Hadrian, George Barton and the Kharsag Documents. Lecturer and Researcher Edmund Marriage, who is behind goldenageproject.org.uk joins us on the program to discuss the researcher Christian O'Brien, the Anu-Nagi (Annunaki), Global Catastrophe, the Restart of Civilization, Genetic Interference, Origins of Agriculture, Farming, the Sumerian Connection, Religion, Mythology and Kharsag (The Garden of Eden). We begin to discuss the work of Christian O'Brien and Edmund's connection to him and his work. We move on to discuss the event's that took place after the global catastrophe, that very likely occurred sometime between 12 000 and 9 000 BC. Who were the Annunaki (or the Anu-Nagi)? We discuss their knowledge, the restart of civilization, language, their sciences, law, genetics, the location of the Garden of Eden (Kharsag) , their efforts to survive and much more. Don't miss our interesting second segment with Edmund. We discuss Origins of Farming, the evidence for the genetic manipulation of seeds and domesticated animals, we talk more about Genetic Interference, Climate Change and we ask about Cyclical Catastrophe, if we again could be facing another Catastrophe? Megalithomania 2006 – Edmund Marriage – The Shining Ones and the Work of the Christian and Barbara Joy O’Brien – Jesus was a Druid.